I made this card for my 4 yr old daughter. She will be missing the “goodbye window” at school when I drop her off. She is moving up to the “Superstars” room next week. She cried this morning so I made this card up today and had it waiting for here when she got home. Needless to say– She loved it! I used 2 SCS challenges to make this card. This weeks “sketch challenge ” (super fun, and easy) and the “ways to use it” (use a retiring set) were the inspiration for this card- and of course my daughter, the princess, was the most inspiration! 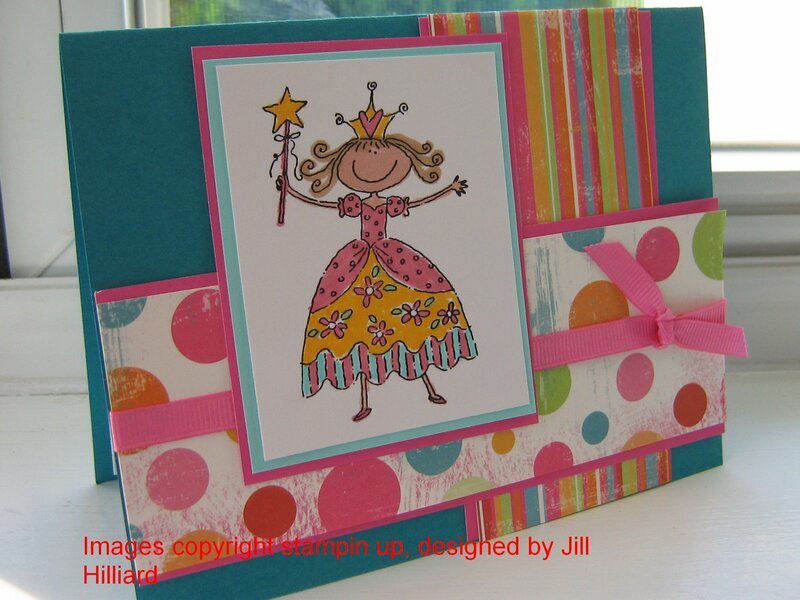 I used Junkitz patterned paper, tempting turquoise card stock for the base, cool caribbean and pink passion for layering, various markers for coloring, and the Pretty Princess stamp set. I’ll be sad to see it go- its perfect for little girls. Thanks everyone who emailed me directly with all the nice comments! made my day!